An early picture of Chen Xiaowang - "No excuses, training every day without fail"
“What ultimately separates those who succeed from the rest is what goes on between their ears and in their heart and souls”. The preceding quote from an unknown source points to the truth that to perform at a high level in any sport or physical discipline demands sacrifices and discipline from participants, and the possession of qualities like doggedness, constancy and a long-term perspective. Without the right mindset it doesn’t matter how much natural ability you have, or which famous teachers you learn from. In a recent interview Chen Xiaoxing highlighted the twin qualities of consistency and perseverance as central to the development of a meaningful level of Taijiquan ability. I remember listening in some years ago during another interview when he was asked about his personal training history. Chen Xiaoxing was visibly annoyed at the suggestion that it was somehow easier in the past. His reply at the time was that the problem facing the contemporary practitioner was not a lack of time, but a lack of commitment and application - plain and simply, too many excuses and not enough training. He countered the distractions facing modern Taijiquan players with the experience of hardship and starvation, political persecution and backbreaking work on the fields or in a brick factory. In spite of everything they managed to develop their skills. A young Chen Xiaowang - "the key to success is consistency"
“Grit predicts surviving the arduous first summer of training at West Point and reaching the final rounds of the National Spelling Bee, retention in the U.S. Special Forces, retention and performance among novice teachers and sales agents, and graduation from Chicago public high schools, over and beyond domain-relevant talent measures such as IQ, SAT or standardised achievement test scores, and physical fitness”. Chen Xiaoxing: "You have to treat a year like a day and that is not easy. It's very easy to train ten times for one day, but to do it year after year..."
Chen Xiaoxing, in answer to the statement that “to achieve what you have achieved must take a lot of time and effort”, answered “you have to work harder than most people can imagine”. He cited the example of his brother Chen Xiaowang’s unceasing practice: “When Xiaowang was training as a professional [In 1980 he was selected by the Henan Sports Council to go to the Zhengzhou Sports Academy to train alongside elite participants from a variety of sports], he was training thirty repetitions of the form a day – every day without fail. The key to success is consistency. You have to treat a year like a day and this is not easy. It’s very easy to train ten times for one day, but to do it year after year… most people can train like this for a few days, but how many can do this for five years?”. Wang Yan, captain of the Chenjiagou Taijiquan School fighting team getting ready for the Thai challenge. 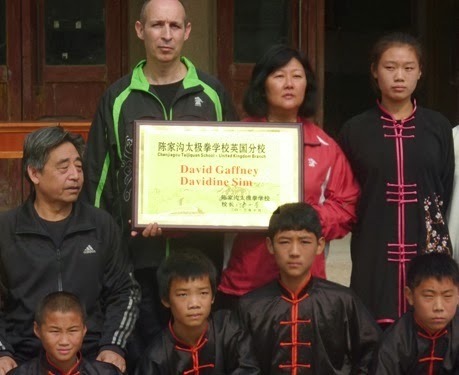 Results have just reached me from the latest challenge match between instructors from the Chenjiagou Taijiquan School and a team of Thai boxers from Thailand. 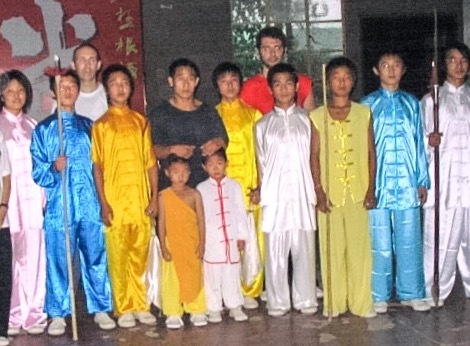 The "Taijiquan PK Muay Thai King Competition" was the highlight of The Third China International Chenjiagou Chen Style Taijiquan Exchange Competition which took place from the 1-5th August in Chenjiagou. Closing the event was a bout between Wang Yan, captain of the Chenjiagou Taijiquan School fighting team, and a seasoned Thai fighter. Wang Yan won a hard fought contest to seal a 4-1 victory for the Taijiquan boys. After the fight, a clearly exhausted Wang reflected on the hard training he and the team had done in preparation for this challenge – “so much hard work for this one moment”. Wang Yan's arm raised in victory! Skill and achievement comes with a price. Over the years I’ve seen Wang Yan and the rest of the team develop from children in the school into powerful, confident martial artists. From the outside it may seem easy, but anyone who has been to the Chenjiagou school knows that these guys train hard. I remember a student some years ago who was homesick and struggling with the gruelling daily training. Going to Chen Ziqiang for advice he was asked to: “Have confidence and walk the road. The uphill path might be difficult but continue to walk it”. Great advice for all of us! That's Wang Yan in front of me with the spear some time in the early 2000s!